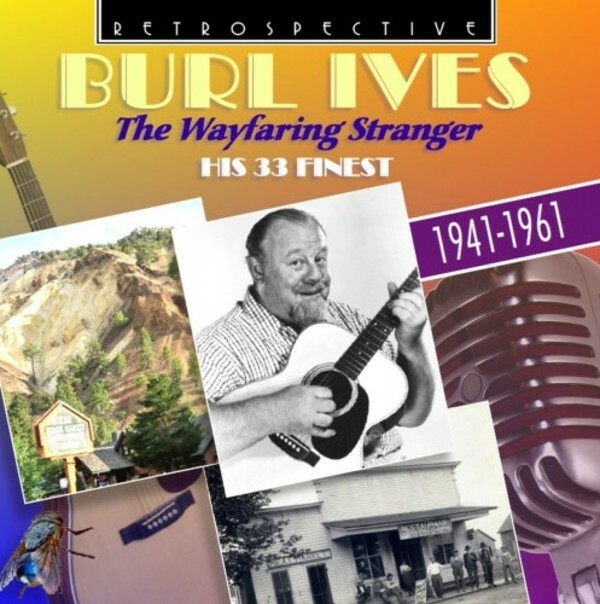 Retrospective presents a comprehensive single CD of the folk singing artistry of Burl Ives (1909-1995), one of the best-loved of all American entertainers. The avuncular, relaxed figure has become an icon both of the folk scene and of the cinema. He was one of the most influential figures of the great post-war folk music revival, alongside such as Alan Lomax, Woody Guthrie and Pete Seeger, and did more than anyone else to bring America�s folk song heritage to the people. The Wayfaring Stranger (his theme song was Poor Wayfaring Stranger) gathers together no fewer than his 32 most popular recordings of the 40s and early 50s. There are many folk tunes he made his own, such as Blue Tail Fly (on which he is joined The Andrews Sisters), Big Rock Candy Mountain, I Know An Old Lady Who Swallowed A Fly, The Foggy, Foggy Dew and Lavender Blue. He also gives fine versions of new songs like Pete Seeger�s On Top Of Old Smoky or Ghost Riders In The Sky. As a bonus 33rd track, the sequence ends with Burl�s biggest hit, from ten years later, A Little Bitty Tear.